Crispy Pakoras are a great finger food. Serve this tasty snack at your next super bowl party or game night. Easy to make these fritters are crowd pleaser. Although their are many different variety of Pakoras or Pakoda ( whatever you may choose to call it) Mixed Pakoras are my favourite as you get a bit of everything. Here’s a simple recipe for you to try in your own kitchen. 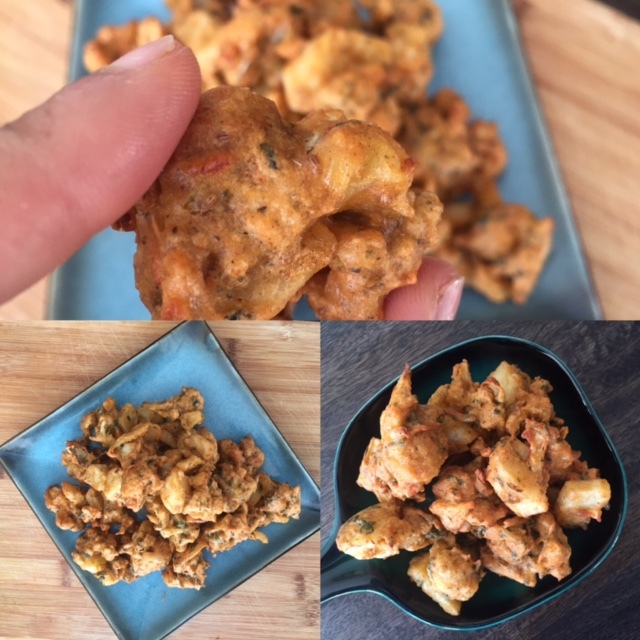 Pakoras were our special treat on rainy days or whenever we had guests over. Spices- Salt, pepper, Amchur ( mango Powder), ajwain ( carom-caraway seeds), chilli powder, Dried fenugreek leaves. Spice level should be adjust as per the quantity you are cooking. Mix spices with veggies and let stand for 10-15 mins. Veggies start to ooze out water. Add in besan a.k.a chickpea flour and make a batter. Deep fry small portions in hot oil. Serve with Chutney of your choice. The best thing about this dish is that its gluten free, dairy free, vegan and you get to eat your veggies. After all, eating vegetables shouldn’t be a boring task. Learn how to make Super healthy, tasty, quick and easy salad – this summer salad is perfect to take to your Canada day or 4th of July Celebrations. Let’s enjoy summer with this clean and delicious salad. 2 sweet Potatoes – Boil and mash them. 1/2 tsp fenugreek seeds (Methre) – These lend that unique flavour to the dish. – Fry for 2-3 mins and add sweet potatoes. Mix well. Add tomatoes. Cook for 2-3 mins. Season with pepper/ garam masala and serve warm. If you are looking for a healthy on the go snack or breakfast recipe idea then these easy homemade bars wont disappoint you. Mix all these ingredients and bake them at 350 F for 30 mins in a baking pan lined with parchment paper.